The What: Extron Electronics has begun shipping several new IP Link Pro control processors, including the IPCP Pro 555, IPCP Pro 355 DR, and the IPCP Pro 255. The What Else: Each high-performance control processor in this lineup features advanced security standards and dual Gigabit Ethernet ports, which ensure compatibility with multiple TouchLink Pro touchpanels using a standard network infrastructure. Of the two Ethernet ports, the AV LAN is designated to control local AV devices, and is secure from outside interference or intrusion. All of these can be used with Extron LinkLicense, which further enhances the capabilities of Extron Pro Series control systems. "Extron recognizes that network security is a growing concern for our customers," said Casey Hall, vice president of sales and marketing for Extron. "While all of our Pro Series control processors use advanced security protocols to safeguard your data, these new IPCP Pro control processors offer the added benefit of a dedicated AV LAN port that further protects the AV network from intrusion and interference." 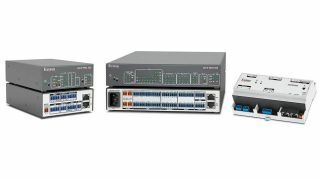 The Bottom Line: The IPCP Pro 555, IPCP Pro 355 DR, and the IPCP Pro 255 are designed for controlling multiple devices and signal types within AV systems requiring an isolated AV network, and can be configured using Global Configurator Plus or Global Configurator Professional software or programmed using Extron Global Scripter. For enterprise-wide applications, GlobalViewer Enterprise can provide centralized AV resource monitoring, management, and control over a computer network.